Pius Hickey despairs about being different and questions his purpose in life... a guardian Angel appears and leads him on a spectacular journey to distant planets and across time in a search for the true meaning of human identity. Will he find the answer? 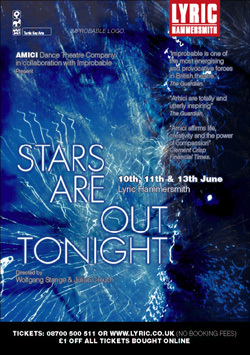 "I count my evenings spent watching the work of Amici among the most rewarding in a year's dance-viewing. To Amici and to Wolfgang Stange, all gratitude." AMICI celebrated their 25th anniversary by collaborating with Improbable. AMICI's pioneering and unique practice collided with Improbable's amazing visual work and reputation for innovative, exciting, accessible theatre. Exploring themes of identity and society through original puppetry, masks, dance, theatre and music, 'Stars are Out Tonight' was creative alchemy and an amazing experience. Devised by Wolfgang Stange, AMICI, Julian Crouch & Lee Simpson.